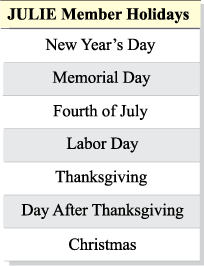 There are seven major holidays recognized by JULIE members. The JULIE Call Center will receive and process your locate requests on these holidays, but member companies will handle emergencies only. Therefore, these days are not included in determining the two working days advance notice required by law. If a holiday is on a Saturday, the Friday before that Saturday is observed as the holiday. If the holiday is on a Sunday, the holiday is observed on the following Monday.